Is DutyOnTime Authentic Or Just Another Fake Website? If you are searching for a review to this DutyOnTime.com, then you are in the right place! That tagged line that says "Easy Money," and you should be doubtful about it. There is no such thing as easy money. You need to work to it. Maybe you are asking me; we are working with it by referring others, yes, but, compared to those jobs that were earning you a sum of money, how does it feel working by just referring? Question: Is DutyOnTime Authentic Or Just Another Fake Website? I know, it's hard to accept, but this website is not accurate. Okay, to be fair, I want to put all the reasons why Dutyontime.com is not worth your time. If you keep insisting it will make you money, if you don't know, I have reviewed several sites that obviously same as this Dutyontime.com. You can check it here: Scam Websites for more information, some of the websites have a different approach but have a similar flow. Dutyontime is simply a bogus website. It does not create online jobs for you. Instead, they are collecting your information especially your email address, and they sell it to other third-party websites. 25$ Signup Bonus is insane, how can a site owner finance such significant amount of money just to signup? Top Reasons Why DutyOnTime Just Another Fake Website? 1. The owner of the site fails to change the domain name! Myearlycash.com? Now, you know that from this, it not real. 2. Registration is simple and straightforward. It's good to be simple and direct but what the hell? This website is giving money yet they are no security mechanism or whatsoever? In a business world, the owner should set broad fields to the users, granting them the protection. 3. Bonus amounts are ridiculous! Don't fall into this trap. Bigger earning money, typically a bogus one. 4. Last Payments is Fake. Aside it is fake, why would they put the Unknown country that makes the US $3490? 5. Recent Comments are anonymous. "Awesome Job! I just make few bucks first time online! " "Lol! first I think it is fake, but actually, I paid in a very first week." "Just got my earning of this week 3560$! thanks pocketmoneyduty." It is new, and they are now putting some comments from random users? Who wrote such comments? 6. Total Earn is fake. Do you think they earned that total amount of money? I don't believe so. Where is the actual proof or evidence for the cashouts? You can't find one either. So stop working with Dutyontime. It will just waste your effort and time. 8. The forum is a MUST. In every website that offers to earn money, I am particular with this Discussion forum. It is the place where members are showing proof or giving tips to other users on how to make money. Dutyontime has NO Forum to discuss. Thus, giving it a title of a Bogus website. In a legit site like ClixSense, they have this discussion feature; you will see how other members show their actual earnings. I believe those[reasons] are a top priority to consider if a website is real or fake. Based on these factors, finally, Dutyontime does not meet the requirements on how genuine they are. For the registered members, please stop working on this website. They are just getting your email address, and you are just wasting your precious time. With that, I have a recommendation for you. Why not try ClixSense? 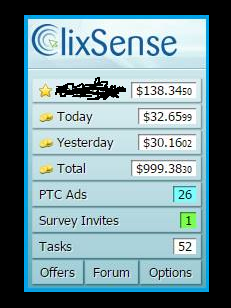 The photo above is my actual proof of earning with ClixSense? It is a small sum of money but its legit though. One of the best things about Clixsense is a member has an option to refer someone. He/she can earn money without referring. There is a Task page for that.